Set your '11-'14 Dodge Charger apart from the rest with this classic Super Bee Style Body Side Graphic Kit. 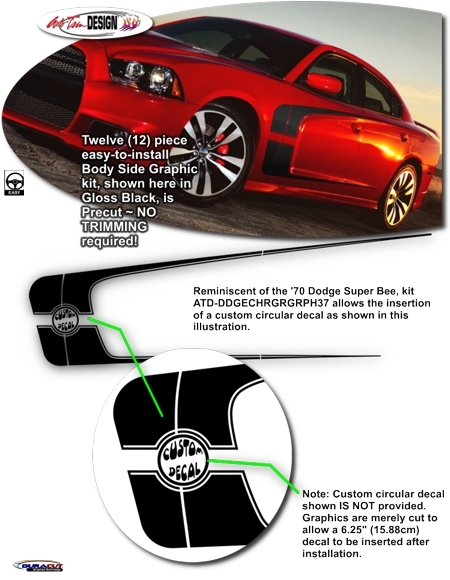 Reminiscent of the '70 Dodge Super Bee, kit ATD-DDGECHRGRGRPH37 allows customization with the insertion of a custom 6.25" (15.88cm) circular decal as shown in the image. Factory installed badging that may be found on some Charger Front Fenders require careful removal and repositioning as desired. Custom circular decal suggested for kit ATD-DDGECHRGRGRPH37 IS NOT provided with the kit. Custom Decal may be obtained from a local Sign/Graphic shop or from an online vendor such as Phoenix Graphics (i.e., Super Bee Circle Kit P/N 6870CBP).